Are you looking for affordable Cairns accommodation or self contained studio rooms, close to the city centre of Cairns Look no further, - it's right here! Cairns Queens Court is a new accommodation complex located within the central city area of Cairns, gateway to tropical North Queensland. Cairns Queens Court is Centrally located, close to the City Centre,s short walk to the vibrant Cairns Esplanade and Waterfront, lagoon, shopping centre. Restaurants, Cinemas, and all tourist facilities. 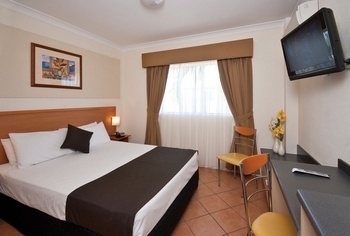 Cairns Queens Court is a boutique hotel offering 81 pristine hotel/motel style rooms ranging from standard 2.5 star accommodation to self contained studio rooms to 4 star rating.Our 4 star rooms have cable television, all rooms have telephone, refrigerator, voicemail, internet. Facilities include outside pool, landscaped courtyard, guest internet kiosk, tour desk. A complimentary continental breakfast is included in our tariff, courtesy airport pick up transfers available at select times. 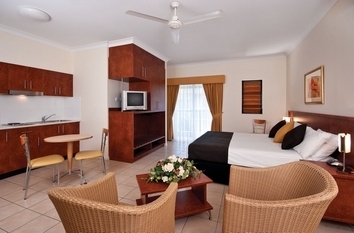 We aim to make your stay in Cairns a most enjoyable and memorable experience. 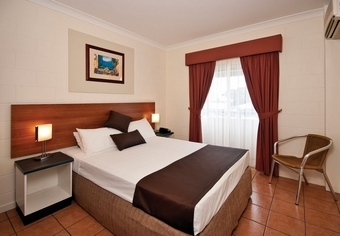 You are always assured of a warm welcome when you stay at Cairns Queens Court. Cairns Queens Court is a owner operated holiday complex combining a relaxed, clean environment with the extra care and friendliness that only owners can bring. We wish to have the pleasure of you choosing to stay with us. The Family room comprises two interconnecting rooms with private bathroom to sleep up to 4 people in 3.5 star comfort. All family rooms include daily continental breakfast and complimentary airport, bus or rail pick-up Monday - Friday from 8am - 5pm (excluding public holidays). Return transfers at select times. The beautifully appointed 3.5 star Superior rooms are just right for business or pleasure. All superior rooms include daily continental breakfast and complimentary airport, bus or rail pick-ups Monday - Friday from 8am - 5pm (excluding public holidays). Return transfers at select times. The beautifully appointed 3.5 star Superior rooms are just right for business or pleasure. All superior rooms include daily continental breakfast and complimentary airport, bus or rail pick-up Monday - Friday from 8am - 5pm (excluding public holidays). Return transfers at select times. Free Broadband and wireless internet connection. Reception hours are from 06.30 to 21.00. After hours arrivals to contact our night manager for instructions to access their room. Duty Manager is available 24 hours. Children 0-3 free of charge if using existing bedding. Rates are per room not per person, Rates quoted are for two people, extra person charge $30.00 per night. On-site parking available free of charge. 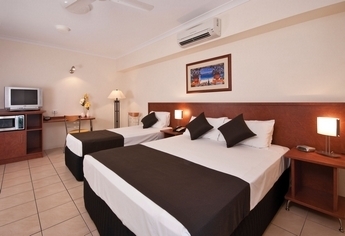 Cairns Queens Court is located on Sheridan Street, the main arterial road from the airport to town. The closest intersection is Upward and Sheridan Streets. Our knowledgeable tour desk and staff will be pleased to assist you in selecting your tours to Port Douglas, Cape Tribulation, The Great Barrier Reef, and the famous World Heritage listed rainforest. Or you may indulge in some adventure tours such as ballooning, white water rafting, hiking, snorkelling or scuba diving. 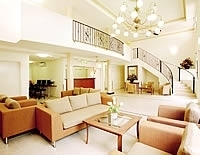 All tour operators pick up and drop off at Cairns Queens Court. Public transport is available at the door for excursions to the Northern Beaches and Suburbs. Public Transport is also available to the city centre.